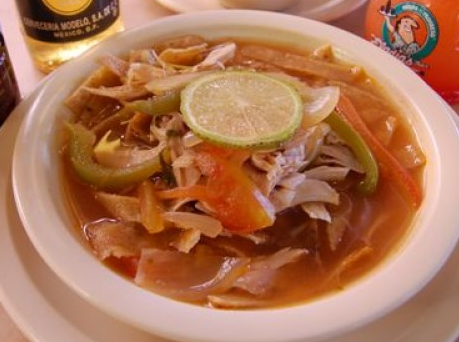 Feature Picture: Sopa de Lima, which was really really good! Evan & I shared this soup and it was quite a meal. I believe you have to accept this establishment as it is: a busy tourist location which is fabulous for people watching, having some beverages, and enjoying their botanas. Eladio’s has to be one of the more popular locations on the malecon for the tourists on the cruise ships. It seems a lot of the local gringos avoid this restaurant, especially on cruise ship days, however we find it to be amusing and accept it for what it is. Eladio’s certainly caters to the boat people by offering them special seating areas, special menus in English with prices in USD, creating a great environment with loud music and party events. The other day, I walked down the beach to visit Eladio’s for lunch as this is where the boys wanted to eat even though it was a cruise ship day. They enjoyed the fact that this restaurant had a pool they could play in while we enjoyed our beverages! We sat in the corner by the pool, hiding from the commotion of the beach and actually met some very nice cruise ship people who sat at the tables next to us. I believe you have to accept this establishment as it is: a busy tourist location which is fabulous for people watching, having some beverages, and enjoying their botanas. If you speak English and a little bit of Spanish, you may be able to convince the waiter that you are not from “the boat” but actually live here and would like to have a menu in Spanish and pay in pesos. This is sometimes difficult especially on cruise ship days. However, there exists a more extensive menu available in Spanish rather than the condensed English version available to cruise ship patrons. The last time there I had to actually show my Mexican drivers license to get the ‘other’ menu which I had been told minutes before did not even exist! Ok, so what is Eladio’s? It is definitely the most prominent restaurant located just off the pier and the right at the beginning of the malecon (boardwalk). Loud music playing from the crackly speakers, with a host shouting out directions for any number of games the guests may be playing on cruise ship days. Last time we were there the boys enjoyed watching the arm wrestling competition, the dance competition, and the huge tug-of-war on the beach. You can watch the people getting on the banana boats, renting sea-doos, or getting massages on the beach. When you order drinks at Eladio’s, a round of botana’s will arrive shortly thereafter or sometimes before you receive your drinks. We always seem to get something different for these appetizer’s and do not always receive them on cruise ship days. The rule here seems to be: if you are drinking we will give you some appetizers! If food just starts appearing at your table, be sure to ask your server what they are. We have not had dinner at Eladio’s yet but we will try this out one time at least so we can give a complete review of the restaurant. To sum up Eladio’s: a great place to have cold cervezas, appetizers and people watch on the beach! Maybe not the spot for a romantic lunch. Here are some of the botana’s you might get at your table!